This morning, I am ecstatic. Excited. Elated. And also honored and humbled!!! 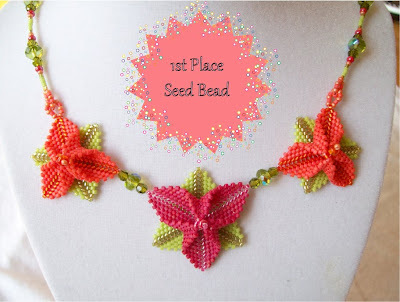 I learned this morning that I won first prize in a contest I entered at Beadazzled in Baltimore! The store is in the Mt. Vernon section of Baltimore on Charles Street. I know I've told the story before, but I'll tell it again. It was in the Beadazzled in Washington D.C., that I was first bit by the beading bug. It was my 25th birthday, and I was walking past the store, and I couldn't imagine how there could be an entire store devoted to beads. I decided to check it out. I fell in love. It was a small shop, but the walls were covered in strands of beads. There was a large table in the middle of the room with hundreds of cups of beads sorted by colors. I purchased a kit that contained a bead board, a strand of pink quartz beads, a baggie of coordinating beads and a couple of tools. I headed home and made the necklace. Then I went back. Twice that day! The rest is history and I've been beading since. It is a huge honor to win a contest among among amazingly talented bead artists (the competition was fierce!). It warms my heart to win a contest at Beadazzled, where my creative fire was first sparked. Congratulations. The bead work in your picture is beautiful. Congratulations! I love the color combination--bright and summery! Oh CONGRATS! I knew this was a winner when you first posted it and I am so thrilled for you! It is a gorgeous piece! Congratulations! Your creation is so beautiful. Thanks for including the pix!